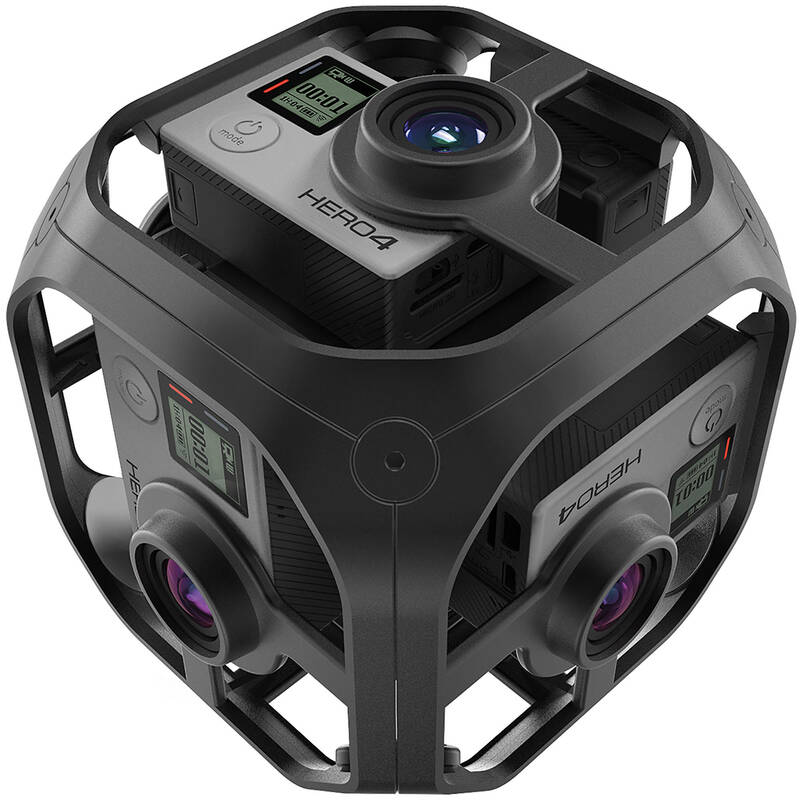 Get started producing high-resolution 360° spherical video content with the GoPro Omni. Included with the rig is everything you need for footage capture, ingest, and processing packed into a convenient waterproof storage case. Six included GoPro HERO4 Black cameras record up to 8K spherical footage when housed inside the Omni rig. The six 32GB memory cards included with the Omni can be read simultaneously using the included card readers and USB hub. Kolor Autopano and Giga software programs are provided for post processing. Instead of relying on the GoPro cameras' internal batteries, a Core SWX HyperCore V-Mount battery and D-tap cable are also part of the kit. A charger and plate for the battery are also included. When you're ready to begin, just give the wireless remote a click, and you'll be on your way. This all-inclusive kit comes with Kolor Autopano Video Pro and Giga software. Video Pro takes the video from the 6 HERO4 Black cameras and stitches it into a single video covering up to 360 x 180°. The process is straightforward: just import your videos using an easy-to-use drag-and-drop interface, select a stitching template or launch a detection from scratch, and then the stitching process is automatic. Giga is another stitching software, which can seamlessly stitch together multiple frames to create faithful panoramas, as well as intelligently remove unwanted transparent artifacts caused by moving and overlapping subjects. Manual control is also possible, through the use of a Mask tool that lets you decide which portions of an image to include or discard from overlapping sections. Plastic tweezers for reaching into difficult spaces, a 3.5mm hex key, and a microfiber bag are included with the Omni, and everything packs away into a waterproof storage case with custom-cut foam. Box Dimensions (LxWxH) 26.0 x 17.5 x 9.0"
Omni (All Inclusive) is rated 2.7 out of 5 by 6. Rated 4 out of 5 by Steve from Yes and No The OMNI certainly provides a better entry into the 360 workflow than anything before it. But if you are hoping for a simple point and shoot it is far from it. I find that most pictures and video needs some sort of assistance via stitching no matter what software you use. The software just doesn't know the difference between your subject and a meaningless background as well as you or even your customer for that matter. If you are entering 360 I would recommend this product as it is a great first step into a professional application vs the other smaller cameras designed for the average person. As for GOPRO the assistance is in need of attention. The typical overseas customer service finds that half the time they don't even understand what I am asking for and when they do they can't help right away, they have to report it and get back to you. It is true when you buy the omni you have to get the software from KOLOR not BH or GOPRO. So once you purchase get on that because they can only alert KOLOR of your purchase. If you don't recieve your software downloads all they will do is Re-submit to KOLOR that you made the purchase. Rated 1 out of 5 by Jesse M. from Terrible system, bad support. Wait or go with something else From the moment I got my OMNI (bought from GoPro, not B&H) I've had problems. I pre-ordered, it arrived 3-4 weeks after the shipping date with no reason or explanation (call centre didn't know why the delay, nor could they give me a time of when to expect it). The camera and software didn't come with a manual. Just general assembly instructions. Here's an important note, anything within about 2 METERS close to the camera won't stitch properly. That's right TWO METERS. So I hope you are shooting everything in a big empty room or football field. The USB hub broke the 2nd time I used it. Logging in to get the software was a nightmare. So was updating. There were no instructional tutorial videos until recently. This is not a plug and play device. You need to pop out all the SD cards and load them one by one to offload. It takes me on average 15 minutes to load a session at the fastest. I lost an entire day of shooting for no reason, nothing was recorded to cards 2-6 even though it appeared to be working normally all day. I called support, got some overseas call centre and they sent me a firmware update for a GoPro4, not the OMNI, which likely would have bricked my OMNI if I had used it. So tech support is useless. I mean completely useless. If you have problems you are on your own. The Kolor software does 80% of the work for you. The other 20% of parallax and stitching issues (which you will have. On every shot no matter what) will take you hours and hours to fix and you might be able to get to 90% of a good shot. I have yet to produce a single perfect take with this camera. I would avoid purchasing this gear. Honestly, go with anything else. GoPro has just been terrible to deal with. Rated 1 out of 5 by David from So much work for not good results! I've been using this on professional projects and it's complete garbage! Not only is the hardware outdated and EOL from GoPro, but the able color space this shoots in is a mess. These are not full GoPros. They do not have all of the WB colorspaces that ship with the Hero 4. My images either look extremely cool or extremely warm. Their is nothing in the middle for indoor shots. Also it does a really bad job at balancing the dynamic range of the images. Even with a flat profile because they are jpegs all you do to fix them is introduce noise. I was hoping coming from GoPro this would be a more seamless product. Speaking of seams, I have yet to stitch an image that does not have an identifiable seam. All in all, between the lack of support, the quality of the images, and the shear amount of work it takes to make any of the images or video useable, this is a really bad product. I'd look to something that stitches for you, or offers more product support. STAY AWAY! Rated 4 out of 5 by Anonymous from Cute Little System in a Big Box Very small little system, but what a big box it all comes in. Thought $4,999 was a bit much for some small video cameras placed in a cube, but once the delivery arrived I realized why this cost so much....Facebook live here I come! Rated 5 out of 5 by Anonymous from Excellent VR camera for the price I've watched films made with the Jaunt, Nokia Ozo, and the Omni. Hard to tell a major difference in image quality. So our team went with the GoProOmni to create VR content. Great price for quality VR! Rated 1 out of 5 by matt from Wouldn’t Recommend I wouldn’t recommend this camera to anyone. How much does just the cage and cameras weigh all together? The Omni weighs approximately 1.05kg / 2.32 lb with cameras and batteries installed. Where are my links to download the free software? If you still have not received any links to your software downloads, I would first check your spam email folder. If you still do not see them listed I would contact our customer service department. What are the pixel dimensions of still stitched photos captured using Omni? The Gopro Omni rig is not water resistant or waterproof. At the moment the Onmi rig is not compatible with the Hero 5 camera. Is this mac and pc compatible? If I buy the camera now (2018) will I get a down load the the current version of Autopano Video 3? From OCT 2018, despite many follow ups for the Kolor Software registration key, only recently they suggest to me to reach out to GoPro Teams...unfortunately gopro support reply &quot;Any Omni orders purchased through an Authorized Retailer (such as B&amp;H) needs to go through the retailer to receive the Kolor Software codes. And no longer have access to generate any new license code due to Kolor end of life support here in GoPro.&quot; So who should I approach on the registration keys for the Kolor software? Does the GoPro Omni records sound? if yes, what equipment and software does it have? yes, it records through each and every camera. so you will have 6 different sound sources. Is there an underwater housing available for this or in the future? As of right now, we do not have any information as to future body modifications for the GoPro Omni.